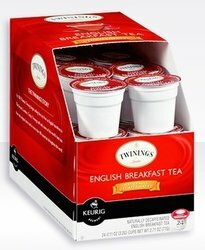 Twinings Decaf English Breakfast Tea K-Cups 24 Count. A rich & satisfying robust tea, traditionally blended with Kenyan & Assam black teas. Each box contains 24 single serve K Cups.